The liver is a vital organ, having a wide-ranging role in digestion, biosynthesis, energy metabolism, elimination of waste and immune regulation. There is a direct blood supply from the gut to the liver. Partly because of this, the liver is very vulnerable to injury as any toxins or poisons that are eaten will rapidly reach the liver. The liver can also be affected by a variety of primary disorders, and disorders of other body systems (eg, diabetes mellitus) will sometimes cause secondary damage to the liver. The liver has an enormous reserve capacity which means that, by the time the cat starts showing signs of liver failure, more than two-thirds of it is usually affected. The liver also regenerates well, which means that recovery is often possible, even after severe liver disease. Jaundice is a common sign of liver disease. Signs of liver disease in cats are usually very vague, such as inappetence, lethargy, weight loss and sometimes a fever. An increase in water intake and vomiting may also be seen. In the advanced stages jaundice may be noticed (yellow gums and skin), and with severe liver dysfunction abnormal behaviour and excess salivation may also occur. With some liver diseases fluid may build up within the abdomen which may give the cat a very pot-bellied appearance. The first tests that are performed in trying to diagnose liver disease consist of some basic blood and urine tests. Bilirubin levels in the blood may be elevated if the liver disease is causing any obstruction to the flow of bile, which helps to tell us a little bit about what type of liver disease may be present. Liver enzymes can be measured within the blood, which gives an idea of whether any liver damage has occurred. The enzymes can, however, also be elevated with a number of other diseases such as diabetes mellitus and hyperthyroidism, and do not give an indication of the severity of liver damage, or how well the liver is functioning. If your veterinary surgeon finds elevated liver enzymes, he or she may wish to then perform another blood test called a bile acid stimulation test, which provides more information on how well the liver is functioning. For this, your cat will be kept in the hospital for a few hours, as the test requires taking a sample after your cat has been fasted for at least 12 hours. Then the cat is fed, and another blood sample needs to be taken two hours later. Haematology (looking at red and white blood cells) may also be performed to look for evidence of infection and inflammation, and to assess for anaemia which can often be present with severe liver diseases. If the blood tests are suggestive of liver disease, X-rays may be taken and ultrasound performed in order to try and further identify the problem. A biopsy (a small sample of the liver) will then need to be taken to try and find out exactly what type of liver disease is present, in order for appropriate treatment to be started. This is a bacterial infection within the liver causing inflammation. It often occurs in conjunction with disease of the small intestine (inflammatory bowel disease) and sometimes also the pancreas. Diagnosis requires a biopsy to be taken and examined for evidence of inflammation, as well as cultured in a laboratory to identify the bacteria involved and which antibiotics it is sensitive to. Treatment with appropriate antibiotics is required. The prognosis is usually good if treatment is started promptly, although relapses can occur. This is where there is inflammation, particularly around the bile ducts within the liver. The cause of this is unknown, but may be due to an abnormality with the immune system (immune-mediated). Diagnosis is made by taking a biopsy of the liver, and excluding bacterial infection. Treatment consists of anti-inflammatory corticosteroids. The prognosis varies depending on the severity. It can be good, however the disease is rarely cured, so life long treatment may be required and relapses can occur. This is a condition where fats infiltrate the liver, causing widespread damage and dysfunction. It occurs when, for some reason, a cat stops eating. This results in a change in the cat's metabolism and release of fats from stored fatty tissue into the bloodstream. Overweight cats are most at risk of developing this if they stop eating, and often there may be another ‘stress factor' that initiates the disease, for example a concurrent disease, or a change in the cat's environment. The disease may be suspected if an overweight cat has stopped eating and then become ill. It can be confirmed on a fine needle aspirate of the liver (inserting a small needle and extracting just a few cells) which will show lots of fat cells within the liver. A larger biopsy of the liver will also be required to look for underlying liver disease, since fatty infiltration can also occur secondarily to other diseases within the liver. Hepatic lipidosis is a very severe disease and many cats will die if treatment is not initiated promptly. The most important treatment for the disease is provision of adequate nutrition. This needs to be provided by a feeding tube. Most commonly a gastrotomy tube (a tube inserted through the body wall directly into the stomach) is used as these are well tolerated by cats, owners can use them at home, and they can be left in for a long period of time. This is important as, although many cats do recover with aggressive therapy, recovery usually takes months. A special diet will be recommended to feed down the tube, and often other nutritional supplements and vitamins are also recommended. Cats are very susceptible to liver damage caused by a wide range of common drugs that may be quite safe in other species. It is therefore essential that you always consult with a veterinary surgeon before giving your cat anything. If your cat becomes ill it is useful for you to be able to inform them of any drugs or toxins your cat may have been given or had access to. Many different tumours may occur within the liver, and may be a primary tumour arising from the liver, or may be secondary spread from a tumour elsewhere in the body. Unfortunately most liver tumours carry a poor prognosis. With some type of liver tumours (lymphoma), chemotherapy may provide palliative treatment. With others (carcinomas), if they are confined to one liver lobe, surgical resection can sometimes be performed. X-rays and ultrasound of the liver can help to diagnose liver tumours, but a biopsy of the area is required for definitive diagnosis. Amyloidosis is a disease where a specific protein (amyloid) is deposited within the liver, causing disruption and dysfunction of the liver, and also predisposing to liver rupture, which results in haemorrhage from the liver. Peliosis hepatica can occur with or without amyloidosis and describes the presence of blood filled spaces within the liver, which again can rupture causing haemorrhage with loss of blood into the abdominal cavity. Both of these diseases most commonly occur in Siamese and Oriental breeds, but potentially could occur in any cat. FAB information sheets are available on two specific infections of the liver, Toxoplasmosis and feline infectious peritonitis (FIP). The treatment of liver disease depends very much on its cause. This is why additional tests such as a liver biopsy are necessary to try and identify the cause of the disease. Specific treatments are described above for the specific diseases. In addition to these treatments, intravenous fluid administration may be required in order to keep the cat hydrated. If the cat is not eating, further nutritional support may be required by placing a special feeding tube. Depending on the type of liver disease, a special diet may be required, which will be prescribed by your veterinary surgeon. The information is the opinion of the writer in the link to the website provided and is not a substitute for veterinary/professional advice. 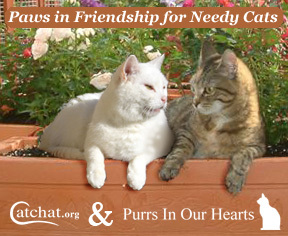 Purrs Owners and Staff are not responsible for the content and information provided through links to other web sites.